Counterfeit! is our newest and much anticipated theatrical concert, a play written by Olivier Henchiri and Jacinthe Hudon. It will be performed by the Ottawa Baroque Consort with actor Pierre Brault. Premise: It's 1696, and England's economy is in dire straits. 10% of all coins in circulation are false. Counterfeiting is widespread, and although it is considered high treason and punishable by death, it would seem everyone is attempting to clip, pound, melt or otherwise fashion silver or other base metals into the likeness of a shilling or a guinea. Many of these are easy to spot, but not those of William Chaloner. With a background in blacksmithing, Chaloner is able to produce moulds that turn out coins of equal, and some have even said better quality than the Royal Mint of England. A devious character and insider connections allow Chaloner to get away with bolder and bolder schemes. But can he fool the Royal Mint itself? And if that worked, could he take on the Bank of England? The government? By the time England wakes up to the fact that the King of Counterfeiting is in their midst, they need a very strong adversary to stop him. The case is assigned to the warden of the Royal Mint of England, a position held at the time by none other than Sir Isaac Newton. At this stage of his life, Newton has retired from a 30-year career at Cambridge University. He is famous the world over for his scientific findings, widely published and consulted on matters of all kind. Yet he is bored with his current situation and ready for a change. The timing is good. He is offered the prestigious position of keeper of the King's currency: Warden of the Mint. And so one brilliant mind is pitted against another. Newton's mandate is not only to stop Chaloner, but also to solve the country's crippling financial crisis and put an end to rampant coin counterfeiting. If he fails, so does the English economy, and Chaloner's life hangs in the balance. Pierre Brault will play both Chaloner and Newton in this play. Playing multiple characters in a single play is a skill Brault has become particularly well known for over his career. Watch as he alternates between villain and detective with only changes in demeanour, voice and posture to tip us off. The talk is roughly 1.5 hrs in duration, allowing for questions and a display of artifacts. The writing of the play began with a terrible case of writer's block! Follow us as we get through this and go on to write and stage the play. A humorous series of episodes takes you backstage. 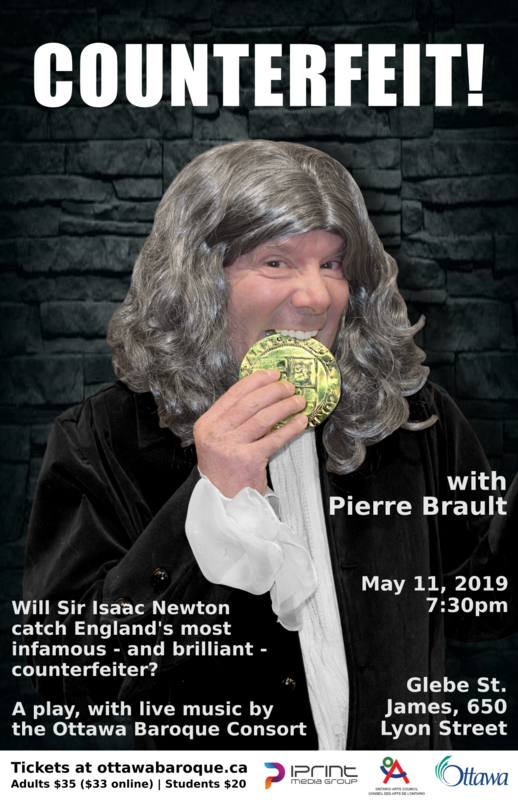 The play itself will be presented SATURDAY, MAY 11, 2019, 7:30 PM at GLEBE ST JAMES UNITED CHURCH, 650 Lyon Street South, Ottawa, by THE OTTAWA BAROQUE CONSORT with actor PIERRE BRAULT.